Earlier this year, I wrote an article called “Smells Like Chlorine” that discussed the chemistry of odors that can arise from chlorine and other chlorine-based substances in drinking water and in poorly maintained swimming pools. Other WQ&HC articles have focused specifically on drinking water and chlorine smell, why some individuals are more sensitive than others, and why the water remains safe to drink. But did you know that the odor, taste, and sometimes even the appearance of drinking water often changes when a treatment facility alters its method of disinfection1 or when the the quality of the source water, especially rivers and lakes, change with seasons of the year? A public drinking water system, and there are over 150,000 in the US alone, may decide to change its treatment or disinfection practices permanently to address changes in source water or to help comply with disinfection byproduct regulations—particularly by switching from free chlorine as the disinfectant to chloramine. But most disinfectant changes are temporary, typically lasting less than a month in duration. Whether long- or short-term, changes to a system’s disinfection process are often associated with warnings or reports of a “chlorine-like smell” and possibly discolored tap water. (I remember one particularly vocal complaint from my mother-in-law in 1979 when I worked at the Louisville Water Company and we changed disinfectants for a short period of time.) The number of communities adopting these short-term changes in disinfection have increased in recent years in response to a regulatory focus on optimizing disinfection processes. Some temporary changes are unplanned and made in response to a problem within the treatment system, such as those triggered by indicators of drinking water quality. For example, a recent finding of E. coli bacteria (which indicates potential contamination from human or animal waste) in a treated drinking water storage tank in South Kitsap, WA, led to a temporary boil-water advisory and increased chlorination in the system’s remaining storage tanks as a precautionary measure. These precautionary actions help assure that consumer risk is minimized when potential problems are indicated. But most temporary changes in drinking water disinfection practices are scheduled (annually) and reported in advance—typically to warn customers of potential taste and odor issues and assure them of its continued safety. The majority involve switching from chloramine to free chlorine as a disinfectant during winter months when lower temperatures result in lower levels of disinfection byproducts. These routine process changes help to stabilize disinfectant residuals during warm weather months and are done in accordance with state and federal regulations to minimize water quality impacts. These scheduled changes in disinfection practices usually coincide with routine pipeline “flushing” through fire hydrants to help disperse chlorine throughout the distribution system and to remove any accumulated sediment in the pipes. Local news articles and press releases abound on this widespread practice, ranging from big cities like Indianapolis, IN, to small towns like Clayton, NC. In some communities, switching from chloramine to free chlorine is referred to as a “chlorine burn,” but this term is misleading—the chlorine levels used remain within regulatory limits and the resulting water is safe for drinking and bathing, despite a potential change in odor. Any chlorine odor can be substantially reduced by cooling drinking water in an open pitcher in the refrigerator for an hour or two. Alternatively, the odor can be reduced using a pitcher-type water filter or by installing a carbon filter at the tap. Every year, many public drinking water facilities across the US change their disinfection procedures. Most changes are scheduled in advance as part of routine maintenance, but some are in response to a real or potential problem within their treatment facility, storage, or distribution system. Although these changes can be associated with changes in the smell, taste, or even appearance of your drinking water, compliance with all federal Safe Drinking Water Act standards ensures public health protection. Steve Hubbs retired from water treatment operations at the Louisville Water Company in 2004. He was involved in the development of the first chlorine by-products regulation in 1975–1979 and remains an active volunteer in the drinking water community today. 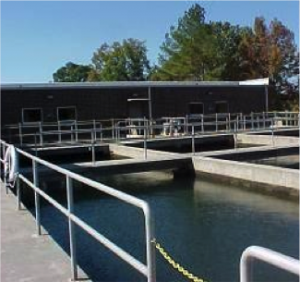 1 Disinfection in drinking water treatment destroys or inactivates waterborne microbes that can cause disease, most commonly through chlorination or use of chlorine-based disinfectants. World Water Day 2017: Why Waste Water?